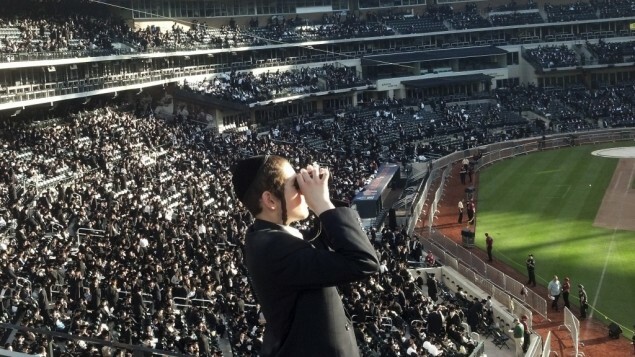 Among the many lasting impressions I came away with from the Internet asifa at Citi Field was the image of non-Jewish policemen and policewomen turning to face the dais in centerfield as Rabbi Ephraim Wachsman delivered one of the most passionate parts of his speech. Throughout the event, police ringed the field, looking up at the stands as part of the special security measures. There were even snipers on the roof and NYPD helicopters circling above. No beer or alcohol was sold at the event; the police were not looking for unruly, drunken, brawling fans who might charge the field. Rather they focused their gaze up into the stands for possible terror threats – and, baruch Hashem, there were none, thanks in great part to their efforts. Then he reached his crescendo. This entry was posted in Internet Addiction and tagged Asifa, Citi Field, dangers of the internet, Ichud, Ichud Hakehillos, Internet, media coverage, orthodox Jews, Rabbi Ephraim Wachsman, Rabbi Wachsman, religious Jews.